To paraphrase Spider-Man's dear departed Uncle Ben: "With great weight comes great responsibility." In other words....get outta the way! 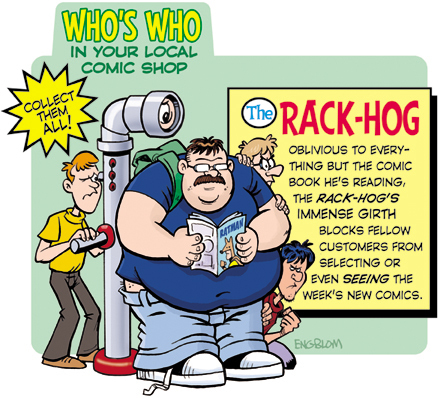 The Rack Hog is indeed a problem for many comic customers, but what's great is that many comic stores have begun to adress the problem by installing *Aisles Periscopes* (pictured). Sure, it's horribly cost prohibitive for the store owners, and you only get to see the books on the top shelves, but hey, who doesn't like periscopes? Hi Greg! Yeah, the periscopes are definitely a step in the right direction, but blocked-out fans want MORE! Angled mirrors, closed-circuit TV monitors, big-screen projection TV of the comic racks....ANYTHING to see past the Rack-Hog! Anoter thing I noticed is that the Rack-Hog is so involved in his issue of Ratman that the one guy is practically *climbing over him*, and he appears not to even notice. I can guarantee that if someone was trying to get that familiar with me at the comic store, I'd be forced to back him up against the Aisle Periscope and let him have it. Then again, if I remember correctly, that issue of Ratman was pretty engrossing. Well, that's just the thing. The defining characteristic isn't so much his great size (thought that's definitely part of the problem), but rather his oblivious self-absorption. The guy just can't be bothered with other customers trying to sneak a peek at the new comics. He's got comics to read, after all! As for the issue of Ratman, you're right. That one was CLASSIC! I'll never forget that scene where his dying father gives him that last bit of magic cheese.